We learn a lot of words growing up. We learn a lot of words at school. We might even learn some at college. But as expansive as our vocabularies can become through traditional means of education, let’s not forget that video games can teach us new terms as well. And they’re often some weird ones. I started playing games on a Commodore 64, at the age of 4. I am now 37. In that time I’ve been introduced to all kinds of mysterious words from playing video games, many of them from playing titles that I maybe shouldn’t have been playing at such a young age, some from developers throwing terms in that they thought most people were familiar with and were in fact wrong. I’m sure you have too. And that’s what’s so great about this! We could each draw up a list of ten words we learned playing video games growing up and each list would probably be ten different words, depending on how old you were, what games you were playing and how terrible your school system was. It’s not to say video games are somehow an essential part of our general education. We absorb new words from everything we do and consume, from the books we read to the movies we watch. But video games just seem more...random. The words are so often obscure, niche, enthusiast, things you wouldn’t normally come across unless you were super into something. It’s not often kids under 10 run into the word “Ziggurat”, for example. Anyway, here’s a list of the words I can remember learning from video games. And yes, I had to Google “reticulating” to make sure it was actually a real word. A rectangular stepped tower, sometimes surmounted by a temple. 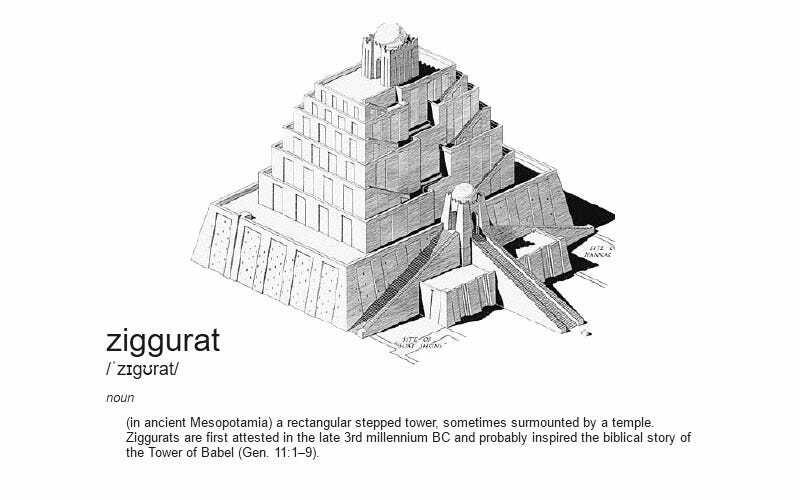 Ziggurats are first attested in the late 3rd millennium BC and probably inspired the biblical story of the Tower of Babel (Gen. 11:1–9). A sharp-pointed duelling sword, used, with the end blunted, in fencing. Scientific tests or techniques used in connection with the detection of crime. A hinged surface in the trailing edge of an aeroplane wing, used to control the roll of an aircraft about its longitudinal axis. Divide or mark (something) in such a way as to resemble a net or network. Restrict or impede (someone or something) in such a way that free action or movement is difficult. There are probably a lot more, but these are the ones that stick out in my mind has having definitely been found in video games. If you’re like me (or Chris), and have a list of your own, give us some examples below! I’ll get some of the better ones and add it to the post. This story was originally published in 2014.